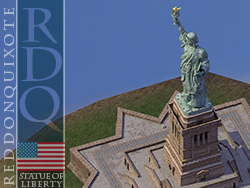 The Statue of Liberty is a colossal neoclassical sculpture on Liberty Island in New York Harbor in New York City. It was designed by French sculptor Frédéric Auguste Bartholdi and dedicated 1886. The statue is of a robed female figure bearing a torch and tablet. A broken chain lies at her feet. The statue is an icon of freedom and of the United States, a welcoming signal to immigrants arriving from abroad. This is my 31st BAT, and my very first BAT release for the LEX. 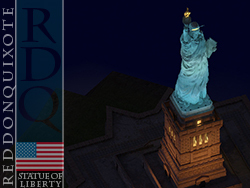 The Statue of Liberty is a Landmark overhanging prop that sits on 1x1 lot (Covers approx. 8x8 lot space). Costs §2500 to build and §150 per month. There are two versions of the model. 1) The familiar patina green version atop a tiered platform, as we see today. 2) A copper metal version on a grassy mound, as she first appeared in 1886.